(AFP) - Pope Francis assailed the "insatiable greed" of today's consumerism at the Vatican and pilgrims crowded into the church at the traditional site of Jesus's birth in Bethlehem on Tuesday as Christmas celebrations began worldwide. Thousands attended mass on Monday night at the Vatican's Saint Peter's Basilica, where Pope Francis, the head of the world's 1.3 billion Catholics, offered his Christmas homily. "An insatiable greed marks all human history, even today, when, paradoxically, a few dine luxuriantly while all too many go without the daily bread needed to survive," the 82-year-old pope said. Pope Francis will deliver his sixth "Urbi et Orbi" address on Tuesday, Christmas Day -- when Christians celebrate the birth of Jesus Christ -- to pilgrims gathered in Saint Peter's Square. Visitors from across the world gathered in Bethlehem on Christmas Eve ahead of midnight mass, queueing to see the grotto where Jesus is believed to have been born and taking in a festive parade. In the "little town" in the occupied West Bank, the Palestinian scouts and a bagpipe band paraded in Manger Square across from the Church of the Nativity, built where Christians say Mary gave birth to Jesus. Crowds, some wearing Santa hats or holding balloons, looked on at the square decked out with a giant Christmas tree and a manger as carols in Arabic played through speakers. "It's a great opportunity to be in such a symbolic location for Christmas," said Lea Gudel, a 21-year-old French student studying in Jerusalem, who was in Manger Square on Monday morning. Later in the day, musical groups took the stage at Manger Square in front of the Christmas tree, illuminated as night fell, to sing Christmas carols. This year, visitors were also able to view the Church of the Nativity's newly restored mosaics dating to the Crusader era after they were recently cleaned and repaired in a major project. The first church was built on the site in the fourth century, though it was replaced after a fire in the sixth century. A newer and more spacious church, St. Catherine, is located next door to the basilica and is where midnight mass is held. 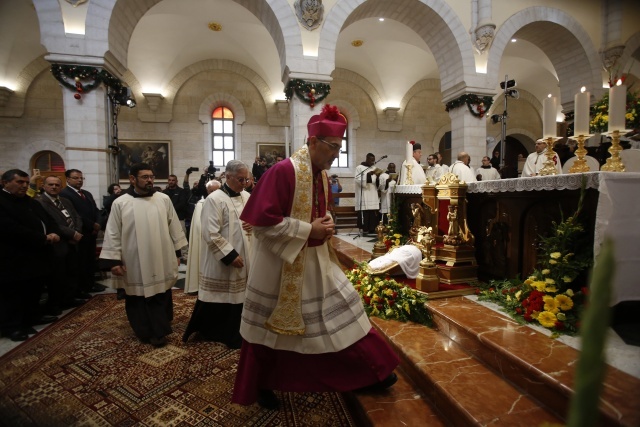 Hundreds of worshippers crowded into the stone church for the mass led by the Catholic archbishop for the Holy Land, Pierbattista Pizzaballa. Palestinian president Mahmud Abbas was among dignitaries in attendance. Pizzaballa in his homily spoke of a "responsibility of caring for the city and the land where we live." "Not to own or occupy it, but to transform it from a simple urban area of private services and personal interests, to an area and place that provides the experience of communion, peace, relationship and sharing." Bethlehem, located near Jerusalem but cut off from the city by Israel's separation barrier, has seen an increase in visitors this season after several down years due to unrest linked to the Israeli-Palestinian conflict. Beyond Bethlehem, Christians worldwide were beginning to mark Christmas after a year in which leaders warned over violence against fellow worshippers. On Friday, Pope Francis said "new extremist groups spring up and target churches, places of worship, ministers and members of the faithful." The US National Park Service said that it would remain unlit and closed to the public "until further notice," with checks being made for damage following an attempt by an intruder on Friday to climb the tree. The tree, whose spectacular lights were switched on at a ceremony attended by US President Donald Trump earlier this month, became a forlorn symbol of the dysfunction gripping Washington two years into his presidency. In Britain, Queen Elizabeth II will call for respect and civility in a Christmas message delivered with the country badly divided over its impending exit from the EU. Barcelona was meanwhile on alert after the US State Department warned of the risk of a terrorist attack in Spain's second-largest city during the Christmas holidays.